SAY HELLO TO GRETZKY! 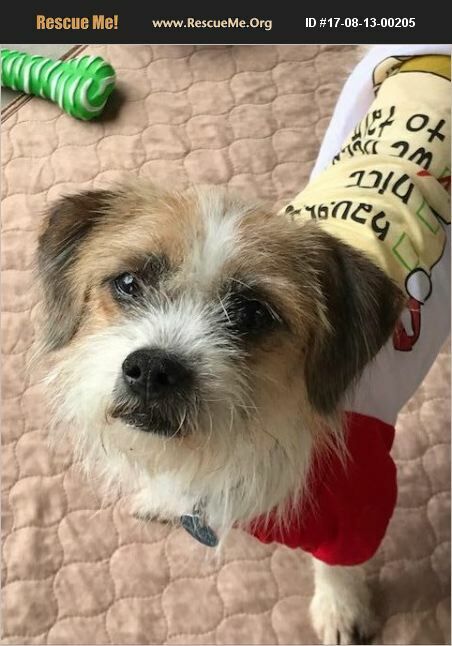 Gretzky is a very handsome 6 year old Shih Tzu / Jack Russell mix boy. Weighing in at just 16 pounds, this little sweetheart was surrendered through no fault of his own. Gretzky's elderly owner became ill and was no longer able to provide care for him. Gretzky has been a woman's dog and was raised in a quiet household with other dogs. He has been rather sheltered and has not had a great deal of experience in the big wide world. He's protective, eager to please, loves to be on your lap an behaves well in the car. When meeting strangers, he is wary of them ~ again, because of his sheltered life that consisted of his owner and his housemates. Gretzky's ideal adopter would be a mature single woman or an adults only home or adults with older teens that live a laid back quiet lifestyle. Gretzky's white with red coat is of a medium length and is low maintenance and hardly sheds. He would require occasional brushing and would do well with a professional grooming once in awhile. His hair does not grow long and rarely mats. This sweetheart of a guy would make a wonderful addition to your family! He is low key and low energy. Gretzy's adoption fee is $225. This fee includes his Veterinarian visits, neuter, all vaccinations including rabies and bordatella, de-worming, microchip with lifetime registration and professional groom.